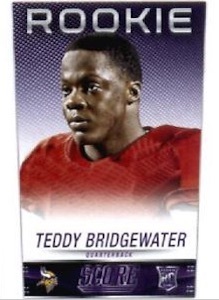 Out of all the names in the 2014 NFL Draft, Teddy Bridgewater was one that produced some of the highest levels of interest. 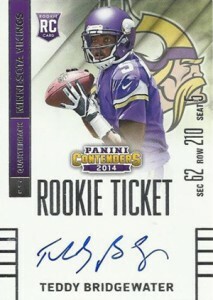 Okay, maybe not Johnny Football levels of interest, but pundits thought more highly of his long-term potential in the NFL and fans and collectors were quickly impressed by the exciting rookie. 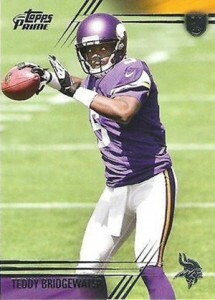 While he was not expected to start so early in the year, an injury thrust Bridgewater into the starting QB spot for the Minnesota Vikings. 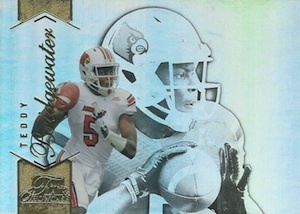 Already a collecting favorite, this has pushed hobby interest much higher for the former University of Louisville quarterback. 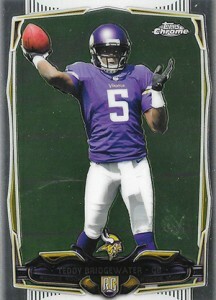 Shop for Teddy Bridgewater cards on eBay. 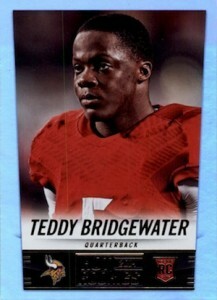 As a highly-rated recruit out of Florida, Teddy Bridgewater was a popular dual-threat prospect for many big programs. 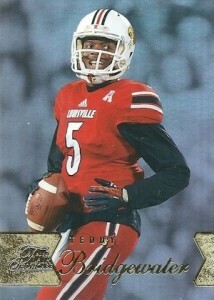 After originally committing to the Miami Hurricanes, Bridgewater eventually decided to play for Louisville. 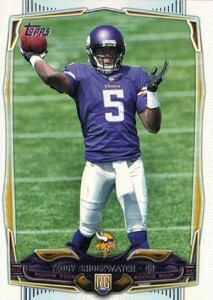 Several games into his freshman season, Bridgewater assumed the starting spot and did not look back. 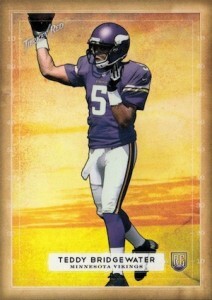 He progressed each season, increasing his yards and touchdown passes, and cutting down on interceptions. 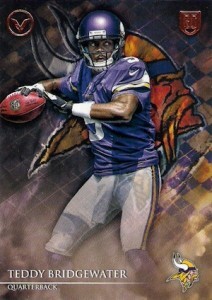 After finishing up his junior season, Bridgewater announced he would forgo his senior year and enter the NFL Draft. Despite early expectations of being a top five pick, Bridgewater experienced a draft slide largely attributed to his underwhelming pro day. 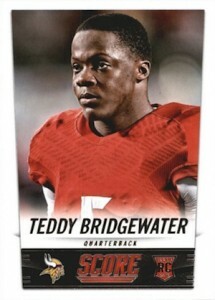 His stock fell leading up to the draft and the Minnesota Vikings traded up to the last pick in the first round to select Teddy Bridgewater with the 32nd overall pick. 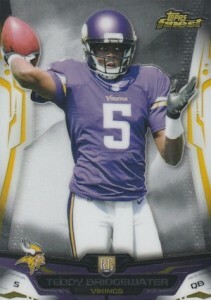 He was the third quarterback off the board, taken after Blake Bortles and Johnny Manziel. 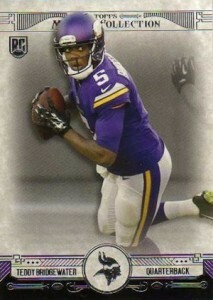 Starting the year as the backup combined with injuries made for an inconsistent season for the rookie quarterback. 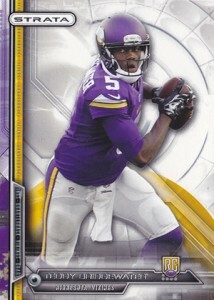 However, Teddy Bridgewater did put together some impressive performances and seemed to improve during the last half of the year and was selected as the Pepsi Rookie of the Year by fan vote. 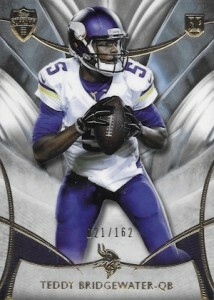 There is a lot of uncertainty in Minnesota right now, but Bridgewater appears to be one of the main bright spots. 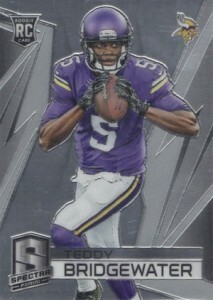 While rookie collectors will want to check out 2014 Panini and Topps products for official Teddy Bridgewater rookies cards, they are not the only options. 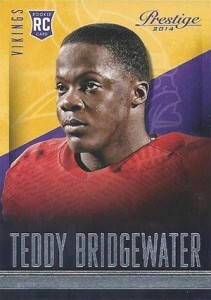 The very first card for Bridgewater came from 2011 Leaf All-American Bowl. 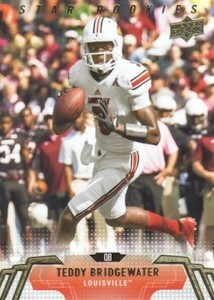 The product honors high school players from the 2011 U.S Army All-American Bowl and includes multiple autograph options. 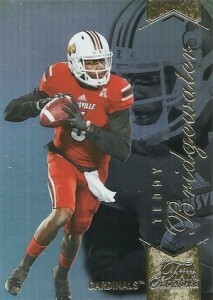 2013 Exquisite also offers collectors an early look at signed Teddy Bridgewater cards. Leaf is a brand that has seen a strong increase in reputation in recent years and their 2014 football products might be their best yet. 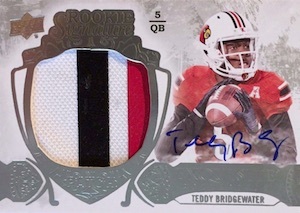 Although they are not licensed by the NFL, the quality look of Teddy Bridgewater cards in 2014 Leaf Valiant and 2014 Leaf Trinity have resulted in considerable interest. 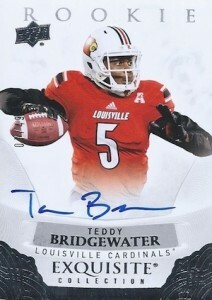 Upper Deck products take a college view of Teddy Bridgewater and offer a good mix of base and autograph options. 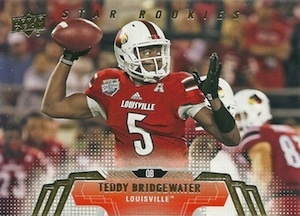 Not all collectors care for the college jerseys, but the cards generally feature great photography and Upper Deck has plenty of respected brands to call upon in their arsenal. 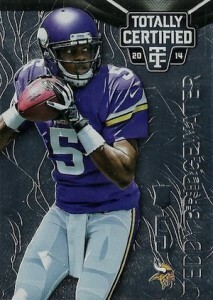 The 2014 Exquisite Collection Rookie Signature Patch card for Teddy Bridgewater is the top non-NFL option. 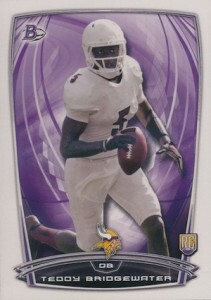 Even with all these options, the most popular Teddy Bridgewater rookie cards are found in 2014 Topps and Panini products. 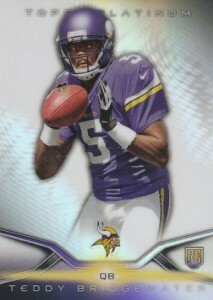 One downside to the early releases are the photoshopped jerseys and the recycling of images. 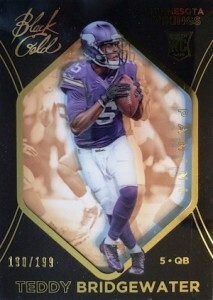 However, the later releases offer new images and on-card signatures, making options like Immaculate Collection, Contenders, Inception and Five Star some of the top overall Teddy Bridgewater rookie cards. 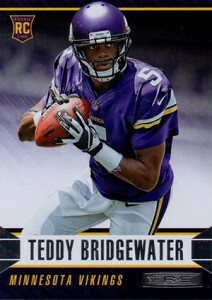 The following visual guide looks at all the main rookie releases for Teddy Bridgewater among Topps and Panini products. 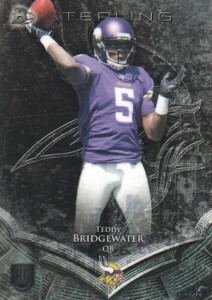 Below that, there is also a visual guide for his other prominent college and pre-rookie cards. 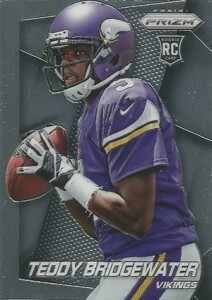 Official rookie cards are shown as well as the main options for products without a true rookie card set. 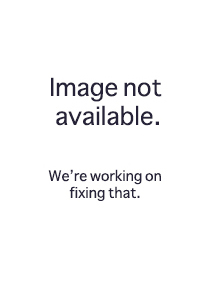 Click on the images or listings to shop for singles on eBay. Parallels are shown when necessary. 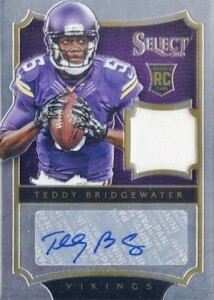 I obtained a Teddy Bridgewater totally certified 2014 rookie penmanship #3/10. 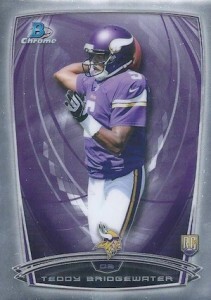 I don’t want to sell it, but I’m curious and I would to know his value. 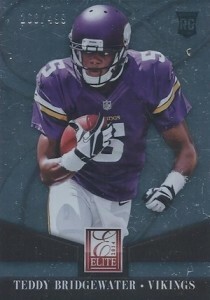 S�bastien C. � Low-numbered parallels are tougher to assign value to since there is little information to work with. 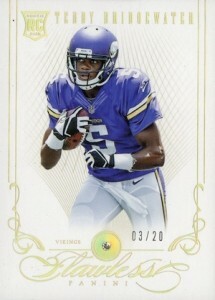 The Gold version, numbered to 5 copies, sold for $100. Maybe $50-75 for yours? 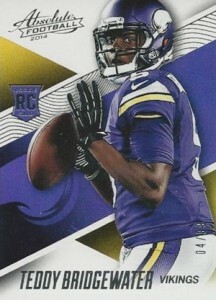 I open four box this afternoon: one topps update 2014 baseball, one panini contenders 2011/2012 hockey, one score NFL 2015 and one Totally Certified NFL 2014. 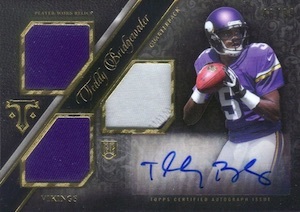 I think the Teddy Bridgewater is my big hit of the day.